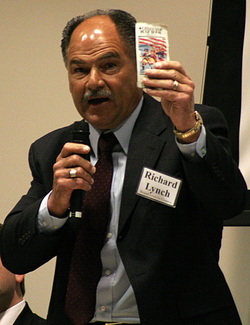 My name is Richard Lynch and I’m from Belmont, NC. I recently met with my Republican representative, Patrick McHenry, to discuss concerns I have with the current tax system. McHenry was elected to Congress when he was 29 years old, nine years ago. His attitude and total disregard for constituents’ concerns directed me to the conclusion that, “This man needs to go!” And here I am. I will be challenging him in the Republican Primary in North Carolina’s 10th District next year. After many years of observation, I am convinced our political leaders figured out a long time ago that they could obtain and retain power by promising a little something to everyone. They know that while you claim to believe in and support the Constitution, you would be willing to overlook the principles that guide it if it meant there was something in it for you. It is through the acceptance of these practices that the American people are faced with the debacle in Washington today. Almost half of the American people (47%) have allowed themselves to be convinced that in order to pursue their happiness our government has the right to take from one and give to another. Let's be clear about something. Under no circumstances does YOUR PURSUIT OF HAPPINESS ENTITLE YOU TO THE FRUITS OF MY LABOR! The American people must wake up and realize that there is no such thing as a free lunch. We must stop being hypocrites. We must realize there is no such thing as being a little bit pregnant. Either you are or you aren't. We either learn to live and abide by our Constitution or throw it out and start over. Something I do not recommend. For decades, politicians have run on the false premise that what they were doing was for the children. I maintain that if we truly are to do what is best for our children and generations to come, we must first be willing to admit that what we have done in the past was not in their best interest. Our current practices of spending our children’s future is not only selfish and irresponsible, it borders on criminal. America is clearly at the point where we must decide if our future will be more secure based on true freedom, capitalism and limited government or are we in acceptance that our lives are best served through a government which believes it can better manage our lives for us. Ladies and gentlemen, THIS is our Patrick Henry moment!!! In 1775 at St. Johns church in Richmond Virginia, Patrick Henry addressed the convention with the cold hard fact that the king had placed ships of war in the harbor and troops on the ground. He went on to correctly point out that these ships were not for our protection and the troops were not a sign of the love that the King had for the colonies. No. They were there to force the colonies into submission. He pointed out that the colonies had petitioned, remonstrated, supplicated, and prostrated themselves before the throne to no avail. His suggestion that we have an armed militia was in direct response to the king’s total lack of acknowledging our pleas, and instead, responded with a show of force. Our founding fathers were very deliberate and gave much consideration to this undertaking. For those of you who have read the Declaration of Independence, I am sure you can appreciate the thought, time, passion and consideration that went into its drafting. When in the course of human events it becomes obvious that the actions of our political leaders are not in keeping with our vision of freedom, liberty and self-responsibility, history has taught us that such visions and goals can only be achieved through corrective actions. Just as our founding fathers outlined the long line of abuses and usurpations of the king that ultimately led to the declaring of our independence, let us consider the corruptive and abusive practices employed by our government creating undue hardship for the American people. 1. Our political leaders have made a mockery of the U.S. Constitution. 2. The American people have become subjects placed under administrative law. Our founding fathers were all-too-familiar with this form of law for this was the law of the king. In most instances trials are conducted without a jury and the accused is at the mercy of a biased administrative law judge. It was the intent of our founding fathers for the inhabitants of America to be governed by common law. 3. Our Supreme Court justices have resorted to writing law instead of adjudicating on the constitutionality of laws. 4. Our executive branch is using administrative agencies in order to write laws and circumvent the legislative process. 6. The American people have been burdened with the legal expense incurred as a result of bad legislation, over-regulation, and corruption all created by our political leaders. 7. Even the simplest of our most basic rights, such as the Right to Work, has become a bargaining chip used by political leaders to garner votes. 8. The American people have been placed under foreign jurisdiction through various treaties and acts all without the peoples’ consent and all with the intent of a “one world” government. 9. Our states have been denied protection from invasion as outlined in article 4 section four of the U.S. Constitution, as well as, article 1 section ten par 3. To add insult to injury, our states (aka the taxpayers) have incurred tremendous legal expense in defending themselves against legal actions brought by the very government that was established to defend and protect them in the first place! 10. American citizens are being incarcerated at an alarming rate for breaking laws that have no foundation in either natural or constitutional law. 11. Our political leaders have created a lifestyle of kings for themselves and conduct their political business with total disregard for the American people and with impunity for their actions. 12. We have been left in a state of uncertainty and confusion as our political leaders refuse to govern by the Constitution but instead spend all their time debating back and forth over which party’s unconstitutional agendas are best for the American people!!! 13. Our executive branch is currently under the control of what can only be called a less than honorable individual. This is an individual who was never properly vetted for the position either by his party or the American people. The American people know less about this individual than they know about the background of a petty thief. His anti-American views and beliefs are well documented as well as his agenda for a socialist America and the redistribution of wealth. 14. The executive office uses tactics of vengeance and hatred to drive home their intentions. The most recent being the closing down of the White House to visitors, cutting of our veterans hazard pay, defunding fireworks display on the Fourth of July all the while continuing with a lifestyle that is more opulent and extravagant than the very king from which we declared our independence. 15. The executive branch has resorted to using broad executive orders (over 900 and counting) in order to circumvent unfavorable decisions of the legislative branch. 16. For far too long, we have been subjected to an unfair, unconstitutional and arbitrary politically-motivated tax system that only exists through fear and intimidation. 17. Through agencies such as the IRS our homes, businesses and accumulated wealth are being confiscated without due process of law. WE NEED TO ABOLISH THE IRS!!! 18. The right of eminent domain has been manipulated to the point citizens are losing their property to corrupt backroom business deals. 19. Property is confiscated for trumped-up charges and sold with the proceeds being divided up between law enforcement and government. 20. Under the Patriot Act, Americans can be spied upon by their own government. 21. Federal agents have been given unconstitutional authority to write their own search warrants. 22. Under the National Defense Authorization Act, Americans can be arrested and detained without being afforded due process of law. In every stage of these oppressions, we have petitioned for redress in the most humblest of terms. Our repeated petitions have been answered only by repeated injury. Fellow patriots, we're currently witnessing the destruction of the greatest nation on earth. We’re being held hostage by our own government and all cries for a return to constitutional principles have fallen on deaf ears. We are forced into working harder, receiving less, and paying for an out-of-control government headed by a narcissistic, socialist who, along with his wife, has never loved this country and is on record as saying he wants to fundamentally change it!!! In light of these facts, I submit to you why I believe we need to take America back with disruptive candidates armed with the founding principles of the U.S. Constitution. When your government is being run by self-serving constitutional-destroying politicians, that is when you need to take America back with disruptive candidates. When your government arms its local law enforcement with a military grade arsenal, that is when you need to take America back. When your government gives the FBI the right to write their own search warrants, that is when you need to take America back. When local law enforcement deploys drones over American cities, that is when you need to take America back. When states are no longer allowed to defend themselves against illegal invasion, that is when you need to take America back. When American citizens can be detained without legal representation, that is when you need to take America back. When your homes can be seized, businesses shut down, bank accounts emptied all without due process, that is when you need to take America back. When your tax burden is ever increasing, your national debt out of control all the while the president and first family live a life of royalty and tell you to tighten YOUR belt, that is when you need to take America back. Finally, when your government wants disarm you by repealing the Second Amendment and force you into registering your weapons, that is when you need to take America back with disruptive candidates. History has shown us that all tyrants, despots, genocidal lunatics and power-hungry leaders have all used the disarming of the citizenry as a key and vital step toward absolute dominance. We must NOT, under any circumstance, ever lose sight of this fact. More importantly, we must have an unwavering resolve that we will never give up our freedom. Sadly, the biggest battle facing disruptive candidates, such as myself, is the fact that you wouldn’t vote for me because: Even though you say you support the Constitution, believe in capitalism and individual responsibility, there's a good possibility you still support the idea that it is okay for government to help you out with………. Food stamps, disability, child care, subsidized housing, free cell phones, public education, free health care, energy assistance, and on and on and on. You wouldn't vote for me because even though you say you support the Constitution, believe in capitalism and individual responsibility, there's a good chance that you're not willing to give up your job in public education, the EPA, the IRS, or any of the many other unconstitutional agencies in our federal government. 5) All bills requiring expenditures must disclose total cost, how the bill was funded, the beneficiaries are, who'll pay, and an absolute sunset date. Just as our founding fathers forged ahead against all odds because they believed so strongly in their cause, I too shall forge ahead. I will be that disruptive candidate that will stand steadfast in my quest to restore America back to constitutional government. I will be the candidate that fights for a more fair tax system and the candidate that will fight for zero-based budgeting. I will be the candidate who will fight for the phasing out and eventual abolishment of all unconstitutional agencies. I will be the candidate who does not believe that the taxpayers’ money should be used to “promote the visions and philosophies of Congress.” I will be the candidate who will put the Constitution first and petty House rules and regulations last. But more importantly I will be that disruptive candidate who won't back down. I submit to you that we do not need to change America. We need to change those who WANT to change America!! So the question is, are you willing to bite the bullet and do what it takes to secure America’s future for generations to come? Are you willing to make the sacrifices necessary so that our children and grandchildren will be able to enjoy life, liberty and the pursuit of happiness? Are you ready to take America back? Thank you! God Bless America for all that she is and all that she stands for!! !